The style SWFG spiral wound gasket has been engineered to provide an alternative to sheet gaskets in Class 150 and Class 300 service. Style EQFG gaskets have the inherent strength, resiliency and blowout resistance of spiral wound gaskets, yet require low bolt load for seating. They are manufactured with high purity flexible graphite filler for optimum sealability, and are available for the full range of standard Class 150 and Class 300 flanges, as well as other non-standard low pressure flanges. The style EQFG spiral wound gasket has been engineered to provide an alternative to sheet gaskets in Class 150 and Class 300 service. 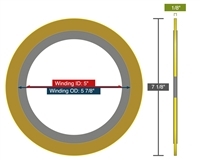 Style EQFG gaskets have the inherent strength, resiliency and blowout resistance of spiral wound gaskets, yet require low bolt load for seating. They are manufactured with high purity flexible graphite filler for optimum sealability, and are available for the full range of standard Class 150 and Class 300 flanges, as well as other non-standard low pressure flanges.